The considerations discussed in our last post—the contexts of discipline, content, and learner – will help in determining strategies for instructional design for online learning, and how best to present content to meet student and curriculum needs. It's helpful to give students an overview of what they will learn from the lesson. In addition to learning objectives, it's good to use an advanced organizer for the content to be presented. This may mean illuminating important information in some way, highlighting or adding additional details. Adding visuals and multimedia, when possible, is useful for providing different perspectives, while also accommodating different learning styles. Rather than waiting to provide feedback on learners' comprehension until the end of the lesson, it's useful to do that all the way through. 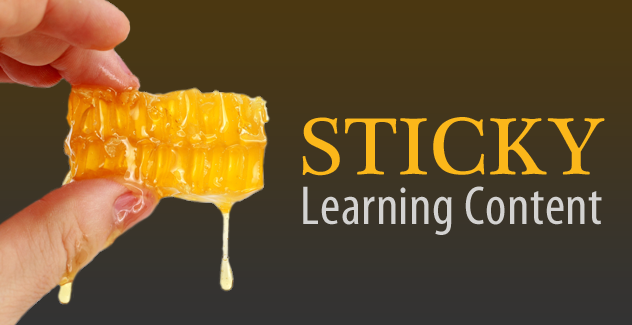 Ensure sticky learning from the get-go; make sure learners get each point as it is presented, so as to build up knowledge as the lesson progresses. The process and principles involved in presenting content digitally to students are no different from what we all do as teachers in the classroom. In preparing to introduce new learning content, we provide some initial indication of what the new unit is about and how it connects to previous content. Part of that process is likely to be diagnostic probing to see to what extent students are already familiar with some concepts to be covered. As we present sticky learning content to students, we don't do it all at once, but rather check to see if students are absorbing it before we move on. To the extent possible, we illuminate the content with materials beyond the textbook, often from online sources. Provide main concepts of the unit succinctly, maybe in bullet points. A short pre-test can be helpful in determining what students already know, while at the same time introducing key concepts. Media such as an image or short video also provide good starting points in sticky learning. Present the content in reasonably digestible segments, rather than one long web page—it's easy to lose context when having to scroll up and down. Annotate key terms and highlight essential concepts, providing definitions, examples, or media through links, parenthetical comments, embedded audio/video, or pop-ups. Interactive learning exercises enable students to work with content, providing more time on task and learning reinforcement. Illuminating the content from different perspectives promotes sticky learning and additional materials from online sources can easily be integrated as well. That could be done on the main content window, in a sidebar or other content containers. Formative assessment can be included on each page. Feedback can be generic, or more specifically tailored to student responses. In-line formative assessments help keep students alert and on track. They can provide encouragement (through positive feedback) and indicate to the student the most salient aspects of the content. Some students may want to further expand their knowledge. It's good to provide additional resources for learning more. Looking ahead to the next unit is a good way to end an online lesson. This strategy promotes sticky learning that will benefit the student as they move from lesson to lesson. SoftChalk Cloud makes it easy to create-your-own sticky interactive activities from flashcards to timelines. Visit our Interactivity and Engagement page for details. In the fourth post (Step 4: Assessing Learning Outcomes), we discuss how to make sure learning objectives are met in terms of student outcomes and curriculum goals. Management System. He is the former Director of the Instructional Development Center at Virginia Commonwealth University and is currently a faculty member in their School of World Studies. His principal areas of research are in applied linguistics and international studies. He writes a regular column on emerging technologies for the peer-reviewed journal Language Learning & Technology (llt.msu.edu) and blogs on intercultural communication at http://acrossculturesweb.com/wp/.